Landscape Depth of Field Tips and Techniques. While some of the more experienced photographers may experiment with a narrow depth of field and get some interesting effects, the normal landscape photographer wants to ensure that as much of the scene is in focus as possible. The easiest way to do this is to choose a small aperture setting. A smaller aperture creates a larger area of focus in the photograph. 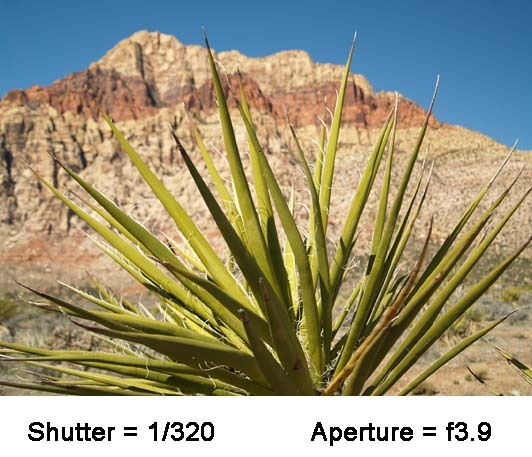 The smaller aperture setting usually shows up as a larger number in that option in your camera's settings. The only problem with this is that you must realize that a smaller aperture means that less light is hitting your image sensor at any given moment. You must compensate for this by decreasing your shudder speed (so it will stay open longer and let more light in) or increasing your ISO (so your image sensor or film will respond quicker to the available light). The two landscapes above show the importance of proper aperture settings. Instead of the landscape being the subject in the first shot, the shrub seems to be the subject since the background is blurred. 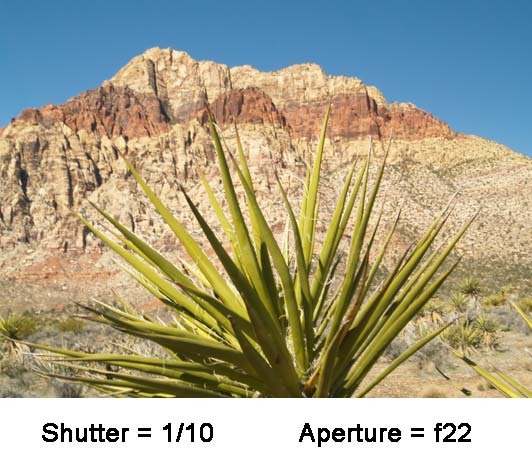 The changes in the aperture and shutter settings for the second shot allow the entire landscape to be equally in focus while keeping the exposure the same. With that in mind, it is always recommended that you use a tripod when taking a landscape photograph. This will decrease the blur that would be caused by subtle movements while your shudder is open. Even if you are shooting at a fast shudder speed, I would still recommend using a tripod. Some photographers even use a remoted or wireless shudder release switch for increased camera stability.